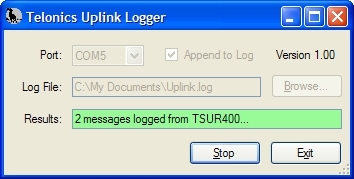 ﻿ Telonics Uplink Logger - Software | Telonics Inc.
Telonics Uplink Logger uses the serial port to log messages from a Telonics TSUR-400 uplink receiver to a file on your PC. You can then use your own custom software to process these log files and convert data from any Argos transmitter, including products from other manufacturers. Telonics Uplink Logger is included with the purchase of a TSUR-400; no authorization code is required. If you have purchased a TSUR-400, you may install Telonics Uplink Logger on as many PCs as you would like.